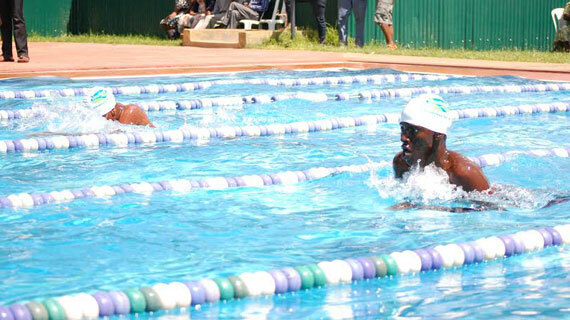 Three Kenyan students set new swimming records in their respective heats at Testimony School to qualify for the finals of the East Africa School Games in Eldoret. Hadassah Mumbi clocked 33.53 seconds in her heat for a new record in the junior girls 50m butterfly breaking the 35.08 mark previously set by Anthea Mudanye of Uganda in Rwanda last year. Tanisha Birungi of Uganda finished second in 39.32 while Orsola Rwabukwandi of Rwanda timed 39.64 in third as Mariam Tendo of Uganda came fourth in 42.29 in heat two. Katanu Kimanzi of Kenya won heat two in 40.74 followed by Carlene Kezimana (43.95) of Burundi but Burundi’s Gianna Igiraneza clocked 53.69 in third failing to qualify for the finals. Usamah Mahmoud of Kenya also broke the record of Andrew Wamarema (1:18.28) to 1:15.38 in the boys open 100m breaststroke while Alexandra Kranck browk her own 36:47 record in junior girls 50m backstroke to 35.65 in the junior girls 50m backstroke. Belly Ganira of Burundi smashed the 27.63 record held by Kenyan Callum Thomas to 25.65 in the senior boys 50m freestyle as Uganda’s Joseph Muhereza lowered the boys open 200m individual medley record from 2:38.21 minutes to 2:24.44. Ian Ngatia of Kenya previously held the record with all the records broken having been set last year in Rwanda during the East Afirica School Games. Most of the swimming categories finals will be held on Friday at Testimony school.